In his recent Opinion in the case of Cubakovic v. GEICO, No. GD08-0004237 (Alleg. Co. April 6, 2011 Wettick, J. ), Judge R. Stanton Wettick addressed a UM coverage issue that involved a construction of the definition of an "insured" under a GEICO insurance policy. According to the Opinion, the Plaintiff, Brian Cubakovic, was injured while riding as a passenger in a rental vehicle driven by a Robert Veinovich. At the time of the accident, the driver of the rental vehicle owned one vehicle that was insured by GEICO. The Plaintiff himself owned a vehicle that was insured by State Farm. Following the accident, the Plaintiff made a claim for UM coverage under the GEICO policy that covered the rental car driver's personal automobile. Judge Wettick noted that if coverage was found, the GEICO policy would have been the primary coverage under the facts presented. GEICO filed a motion for summary judgment asserting that its policy did not apply due to the definition of an insured found in the policy. The Plaintiff and State Farm filed motions for summary judgment that coverage should apply. Judge Wettick noted that the GEICO policy provided that GEICO would pay damages where the insured was legally entitled to recover from an uninsured driver. An "insured" was defined in the policy, in pertinent part, as "any other person while occupying an owned auto." [Emphasis added]. GEICO asserted that since the Plaintiff fell under the category of "any other person" under the terms of the policy, and since the Plaintiff was occupying a rental vehicle as opposed to an automobile "owned" by the GEICO insured, GEICO did not need to provide coverage. "As a GEICO Family Auto Policyholder, when you or your spouse (if residing with you) rents a car in the United States or Canada, the rental car is covered under your GEICO policy. The same policy provisions and conditions, coverage limits and deductibles that apply to your personal car also apply to the rental car." Judge Wettick construed this language to clearly state that any coverage provisions applicable to the insureds "personal" car also apply to the rental car. He also rejected GEICO's contention that the policy deliberately used the term "personal car" rather than "owned auto" and that the two are not one and the same. In this regard, the court noted that there was no definition in the policy for "personal car" and that the term was not otherwise satisfactorily distinguished from the "owned auto" term. Rather, in Judge Wettick's eyes the common meaning of a "personal car" would not cover a vehicle that a person did not own--as such the terms appeared to be interchangeable in this context. The court also disagreed with GEICO's interpretation that the language of the Renewal Declarations was only referring to liability coverages and not UM coverages. Finding the policy language at issue to be ambiguous, the court construed the terms in favor of the insured and against the insurer and found that the GEICO policy should provide the primary UM coverage under the facts presented. Anyone desiring a copy of Judge Wettick's Opinion in the Cubakovic v. GEICO case may contact me at dancummins@comcast.net. 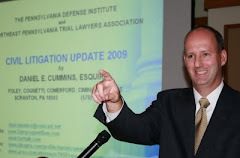 I thank the prevailing State Farm counsel, Attorney Tom McDonnell of the Pittsburgh law firm of Summers, McDonnell, Hudock, Guthrie & Skeel, P.C. for bringing this decision to my attention.